Pipeline constraints have resulted in a build up of stock in Texas. The high supply and constraints in exporting result in a spread between WTI and Brent. Determining an upper bound on this spread is nontrivial. One could look at alternatives to the pipelines (like rail contracts). However caution is needed in determining bounds as can be seen in Canada. Spread between Canada oil and WTI and Brent is north of \$30 when the rail contract for exporting the oil is estimated at \$15 a barrel... This is probably due to the fact that rail contracts are for 5 years and companies don't want to commit to such a contract with new pipelines on the horizon. The anecdote of Canada whilst not a direct answer is to draw attention to the risk of determining a bound of the spread. There are quite few factors that lead to the WTI vs. Brent Crude spread. Firstly in oil trading there are many different types of crude oil grades traded around the world. However, the most popular traded crude oil grades are Brent Crude and West Texas Intermediate (WTI). To understand the differences one first needs to understand some terminology. Generally speaking, oil with an API gravity between 40 and 45° commands the highest prices. Sweet vs. Sour: This is essentially a reference to the sulphur content within the oil. Because sulphur is corrosive, light crude also causes less damage to refineries and thus results in lower maintenance costs over time, i.e. sweet is seen as valuable. Brent refers to four different crude oil grades extracted from various wells in the North Sea – BFOE. WTI is extracted from wells in the United States, primarily from oil fields around Texas, Louisiana, and North Dakota. The fact that Brent Crude is waterborne from oil fields near to the coast of the UK and Norway makes it all the more attractive crude oil due to easier and less cost of transportation from extraction sites. Although WTI is better than Brent in terms of quality as it is lighter and sweeter than Brent Crude. 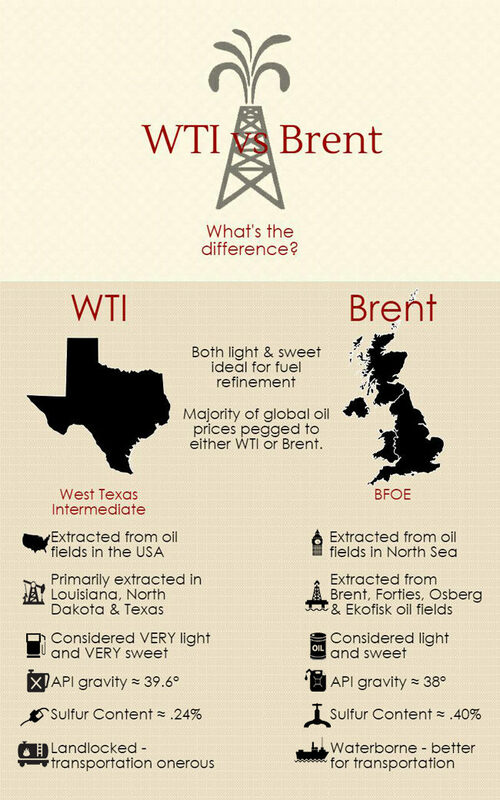 Brent is seen as the major oil benchmark price globally, WTI being the second major oil benchmark price.